You’ve probably heard by now of Bitcoin and other cryptocurrencies. In the space of eight years they’ve gone from a geeky novelty to big business and investors are beginning to take note. There’s an estimated US$US100 billion worth of cryptocurrency floating around in cyberspace. In the real world, there’s a small but growing number of Bitcoin ATMs appearing in the world’s metropolises. Heavy hitters including Microsoft, Virgin Galactic and Expedia now accept Bitcoin as payment, in certain circumstances. For those looking to turn a (tangible) dollar, investing in cryptocurrency has proven to be lucrative. If you’d bought US$100 worth of Bitcoin in 2009, it would now be worth more than US$70 million, but there have been some stomach-churning falls along the way. In the late 1990s, when online transactions were becoming common, tech geniuses started musing about creating a new decentralised currency. A developer using the pseudonym ‘Satoshi Nakamoto’ made those dreams a reality by creating Bitcoin in 2009. The way Bitcoin (and its 900 or so imitators) works is that individuals and groups must ‘mine’ it, much like digging for cybergold. Those who solve a complicated problem using mining software and high-powered computing hardware discover Bitcoins. They can then sell these bitcoins, or whatever the unit of cryptocurrency is, on online exchanges. Like conventional currencies, cryptocurrencies can appreciate or depreciate. As noted, Bitcoin has appreciated spectacularly as has Ethereum, its one serious challenger, which has soared from just above US$8 to US$300 in the first six months of 2017. By definition, cryptocurrencies are not legal tender backed by the full weight of a nation state and its central bank. That raises several issues. First, there’s the practical matter of being able to spend your Bitcoins. As mentioned, some companies and even a handful of government organisations around the world now accept Bitcoins, Ethereum or other cryptocurrencies as payment but the majority don’t. Australia’s private and public sector organisations have remained particularly unenthused about embracing cryptocurrencies. Which is somewhat ironic given many believe ‘Satoshi Nakamoto’ is Australian. Of course, you can exchange cryptocurrency for the old-school kind. But this will involve using an online exchange or, if you’re lucky, an ATM. There are hefty transaction fees involved and sometimes long waits for the transaction to be processed. Regulators are yet to greenlight conventional investment products such as exchange-traded funds based on cryptocurrency, despite attempts by fund managers to do so. That doesn’t look like changing any time soon. An investor seeking windfall profits in a low-return environment may be tempted to overlook all these inconveniences. 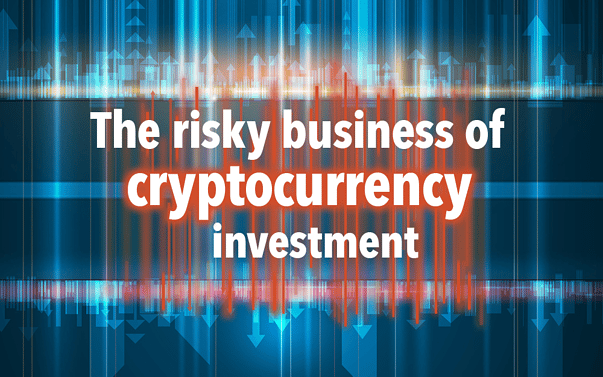 But what can’t be overlooked is that cryptocurrencies are high risk investments. For one thing, cryptocurrencies are hard to trace. That makes them perfect for tax evasion, money laundering and criminal transactions taking place on the ‘dark net’. Unsurprisingly, national governments have been at best suspicious and at worst antagonistic to them. That hasn’t prevented them from gaining traction. Nonetheless, it would only take a handful of major economies mobilising against them (as China has several times) for their value to tumble. Unlike the traditional money overseen by central banks and governments answerable to those they govern, cryptocurrencies are at the mercy of the individuals who have developed them. While it hasn’t happened in any notable way yet, it’s not hard to imagine a scenario where those developers manipulate the currency, possibly by flooding the market to enrich themselves. Finally, and perhaps most persuasively, cryptocurrencies run all the same security risks as anything internet related. Cybercriminals could steal your cryptocurrency; hackers can and have hacked cryptocurrencies and online exchanges can and have shut down leaving their customers out of pocket. In such circumstances, there’s unlikely to be a financial institution, law enforcement agency or regulatory body to provide recourse. All these issues with cryptocurrencies may ultimately be addressed. They may end up being an asset class worthy of serious consideration. But for the time being, they remain a higher risk investment.